Focusing on the design evolution of Aston Martin and Duesenberg automobiles, Tom Matano, Executive Director at San Francisco’s Academy of Art University’s School of design, will present a seminar on the secrets of timeless auto design at the 57th Hillsborough Concours d’Elegance, Sunday, July 21. 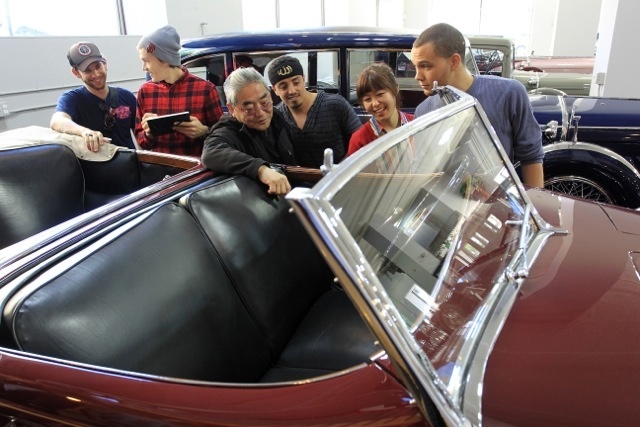 Tom Matano, Executive Director of design at the San Francisco Academy of Art University, takes his design students through refinements in an early vehicle at the Academy. Matano presents a seminar of the secrets of timeless auto design at the 57th Hillsborough Concours d’Elegance, 11 a.m. Sunday, July 21, at Crystal Springs Golf Course. The Hillsborough event is held on the greens of Crystal Springs Golf Course, Burlingame, CA. Hours are 10 a.m – 4 p.m. Admission is $30 for adults and children 13 and under are free. There is a $75 VIP admission that includes parking, access to VIP tent, food and a beverage. Matano, who has held top design positions in both academic and automotive industry circles. will address how automobile evolution is influenced by technology, manufacturing, new materials – and yet some marques, likeAston Martin and Duesenberg, remain timeless through the process. “Aston Martin for example,” says Matano. “Since DB4 it has maintained proportion-correct with great weight distribution in mind. It has a truthful shape to communicate what it does and what’s inside. Never overstated or understated, it looks sporty yet maintains elegance – and an air of nobleness. For more than three decades, Matano was deeply immersed in automotive design on behalf of manufacturers both in Detroit and in Japan. After managing Mazda’s North American Design Studio, he went to Japan where he was an Executive Designer on Mazda’s MX5, RX7 and Miata M Coupe. Charity beneficiaries of the Hillsborough event are Autism Speaks, North America’s largest autism science and advisory organization; the 49ers Foundation, which provides extensive support for at-risk youth in the Bay Area; and the Hillsborough Schools Foundation, which provides support for four public schools in Hillsborough. For further information, go to www.hillsboroughconcours.org.